Sometimes we can't see the forest for the trees--isn't that how the old saying goes? The book world is large and varied like the number of creatures alive in the ocean. Bookstores are certainly not one thing. Mystery stores, kids stores, poetry stores. Used Books. Antiquarian and collectible. Remainder stores. Locally, even, there are groups of book-lovers whose circles I never enter into. The Ampersand Club, for example. In that vein, this past Sunday, my friend Ben and I ventured over to Stockholm, WI to visit Gaylord Schanilec and his studio. I've written briefly about Gaylord and his work on this site before. I have always appreciated his taste in books and other art, his devotion to place and his work--throwback is simply the tip of the iceberg. In any case, he's always told me I could visit his workspace and we finally made it happen. The drive alone was worth our time. Heading into roadways lined by ancient rock and more and more turkey vultures, hawks of all kinds and eagles coming into view. Maybe it's silly to say that this natural beauty paled in comparison to seeing how his work is made. But for me it's true. To say he operates in a different part of the book world is a vast understatement. His website lists him as wood engraver and fine paper worker. It doesn't say what is quite obvious: he is a link to old world art and is absolutely a master craftsman. Watching him walk around the studio and tolerating our rapid-fire questions about his tools and machinery, I couldn't help but think: I am in the midst of real artistic genius. Such talk embarrases him but it's the truth. It was great fun to look through his archives and the amazing library he has amassed on a wide variety of topics: paper, print-making, poetry, you name it. 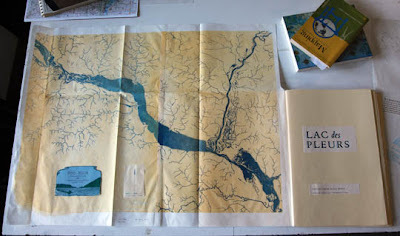 His most recent and ongoing project involves the great river and the studio is filled with books and maps on the topic. We looked at DNR manuals from the 1920's on the fish of MN. Books he had obtained from James J. Hill's personal library. We share a mutual love of Thomas McGrath and he was happy to show us some stuff he had done with McGrath's work. He was so willing to let us paw through all of his stuff whose worth is great in monetary value but even moreso in more ethereal ways. Several times I said, "We should get out of your way and let you work." He shrugged me off and was happy to have us as a diversion/mild annoyance. Our conversation brought up so many names from the history and present of books in this area. I have great respect for those who have helped to form what is now our vibrant and diverse book world. Names like Pat Coleman and Will Powers and Jim Sitter and Rob Rulon-Miller. In fact, I have a Bookslinger coffee mug sitting on my shelf right now--Bookslinger being a book distributor that pre-dates both Bookmen and Consortium and that Mr. Sitter helped found. While I am quite obviously a fanatic for his work in general it became clear to me, on this visit, that this newest work is going to be something on a new level. It's attention to detail and the amazing colors. The map that will fold out from the front of the book. To see all of the woodcuts he has and the paper on the drying racks and revision after revision. The total man hours poured into this is stupefying. 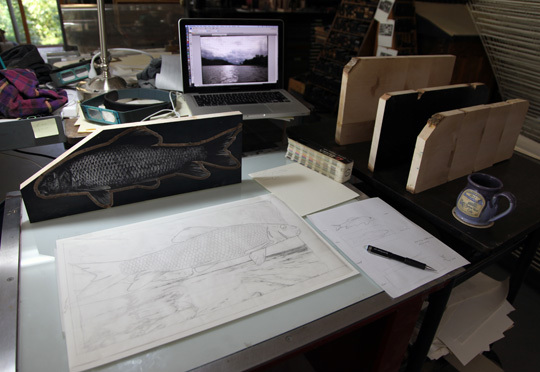 Here is one final link to another paper artist who visited the workshop and was equally impressed. In short, buy this guys work and you will not be disappointed. We're lucky to have him in the vicinity and kicking out stellar books and prints. Thanks for sharing, i like your sharing.